Some experts say that the greatest benefits of gymnastics training for children are physical: the amazing power, the ‘unparalleled’ balance, and injury preventing agility and grace. Other experts say that the benefits are to the mind: the perseverance, the poise, the confidence, the attention to detail, the concentration. Which is right? Our expert coaches know. The answer is, without a doubt, both. In fact, professional gymnastics training is a requisite for all kids who want to learn how to become the best they can be in life. Sound gymnastics training is for all kids. Our recreational curriculum consists of a variety of class levels designed to provide a non-competitive, achievement-oriented program of basic skills and progressions. We keep our class sizes small so that each child can work with their coach to reach desired proficiency at each event and level, and can continue to progress through our program. Along with gymnastics skill development, conditioning and flexibility exercises are introduced as well. We require a minimum proficiency in both of these areas to ensure a safe and successful experience. Our instructors are specially selected and trained to safely bring out the best in each child by encouraging each child. 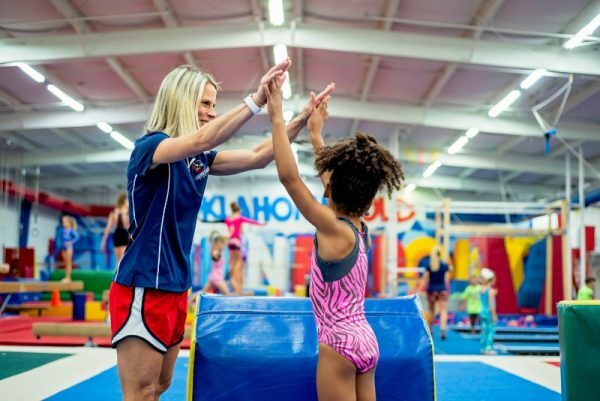 Without question, it is our special instructors who have made Oklahoma Gold Gymnastics the #1 children’s program in Edmond for more than 20 years! Girls Level 1 is a 55-minute class in our Big Gym designed for beginning level gymnasts ages 5 to 7 years old. Our focus in this program is to teach the proper drills and skills for gymnasts entering the beginning levels. Students in this class are reaching towards accomplishing specific goals on all events: cartwheels on the floor, pullover on bars and straddle jumps on the trampoline. This is a high-energy program that places great emphasis on proper form, technique, skill progression and fun. Girls Level 2 is a 55-minute class in our Big Gym designed for intermediate level gymnasts ages 5 to 9 years old. Our focus in this program is to teach girls the proper drills and skills for gymnasts who have moved up to the intermediate level. Students in this class are reaching towards accomplishing specific goals on all events: round-offs on the floor, back hip circles on bars and handsprings on the trampoline. This is a high-energy program that places great emphasis on proper form, technique, skill progression and fun. Boys Gymnastics is a 55-minute class in our Big Gym where boys will grow their strength and learn basic core skills, necessary positions and support holds. A strong emphasis is placed on building strength, increasing flexibility and improving coordination through gymnastics equipment and the Ninja Warrior obstacle course. Boys will utilize specific equipment like the bars, vault, rings and tumbling floor while also having a good time flying on our zip-line. We offer classes for children who are homeschooled on Mondays at 1 p.m. The classes offered are Girls Gymnastics for 6 to 8-year-olds, Girls Gymnastics and Tumbling for 9 years old and over, Boys Gymnastics for 6 years old and over and Co-Ed Ninja Warrior Obstacle Course for 6 years old and over.